Like many communities across the US, mine has a group of dedicated quilters that give of their time and talents to make quilts for our service veterans. 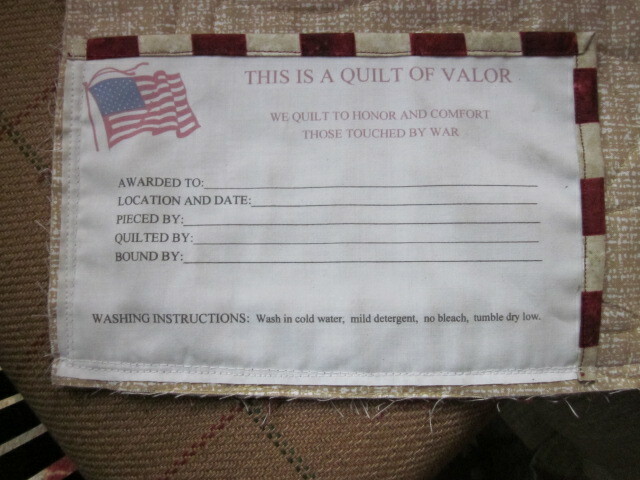 The Quilts of Valor effort is nation wide and flourishing by all accounts. Check out qovf.org for the full story. There are general guidelines for sizes and quality requirements, but in our group, the quilt maker makes the decisions concerning fabric selection and pattern. However, most of the group does stick to the red, white and blue theme. Sometimes a family of a veteran will request a specific color scheme, but that is the rare exception. The labor is all volunteer and in most cases the materials required are all donated. Our group also accepts donations of cash to purchase batting and fabrics for the quilts. I am one of the many volunteers involved and my job, along with others, is to do the hand stitching on the bindings. When I pick up the quilts they are already for me to sit down for the evening and stitch. Even a label is provided for me to stitch on the back. It takes many hands and dedicated people to pull this effort off every year but such a touching tribute to the veterans in our country. Each year, a beautiful display of many of our groups quilts are on display at our McLeod County Fair. 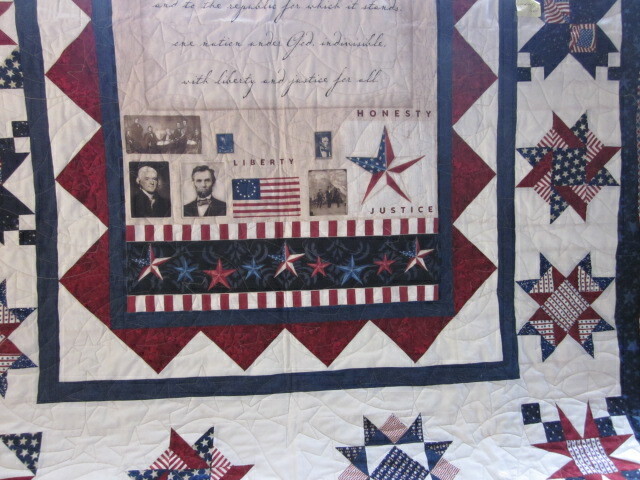 It’s quite breathtaking to see an all-patriotic quilt display. My local quilt shop, Quilt Haven on Main is instrumental in helping our group coordinate the piecing of the Quilts of Valor by providing their sewing studio to the group on a monthly basis so the quilters can gather to sew together. It’s also where we all drop off and pick up quilts for all the various stages of getting the quilt completed. Since we are approaching Memorial Day at the end of the month, I thought I would share the quilts I am working on right now. This is a sample of the lovely labels that are prepared for each quilt. Two sides are stitched on when the binding is attached leaving just the other to to be stitched on my hand. A special thanks to Nancy Greve and her entire group of volunteers who make these quilts and present them to the recipients each year. I shared 2 of these photos with my Quilt of Valor Stars group on Facebook. I love how they still have that “Thimbleberries” look about them. Thank you again for sharing! In 2013, I mada a quilt from a Thimbleberries pattern. I am going to enter that quilt into a quilt show. However, I forget the name of the pattern. 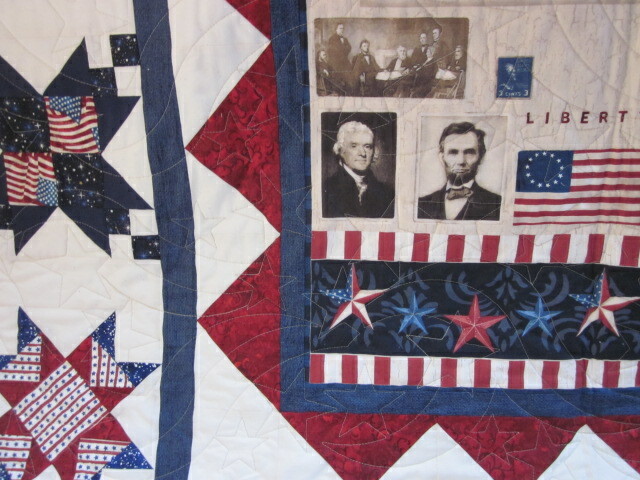 It is a “sampler” quilt with a large Dresden Plate in the middle and Dresden plate/log cabin blocks as well as appliqué. Can anyone help? I want to make the correct identification. Thank you! I am not recalling ever designing a quilt with that description. The Thimbleberries studio closed in 2013 and did not publish any patterns in 2013, but perhaps you used an older pattern. Is there a chance you could snap a picture of it and send it to me at lynette@thimbleberries.com and I could take a look and determine for sure if it is a Thimbleberries design? Sometimes I need a picture since we all describe things a little differently. I published hundreds of patterns in past 30 years and just don’t recall that one. 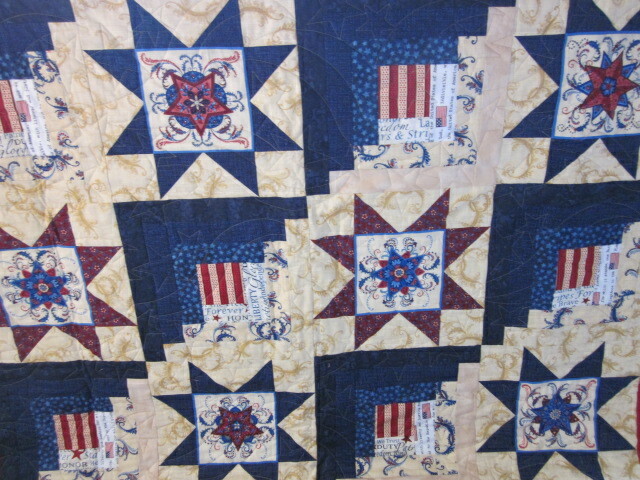 Thank you, Lynette, for the very nice pictures and comments about the Quilts of Valor project here in Hutchinson, MN. 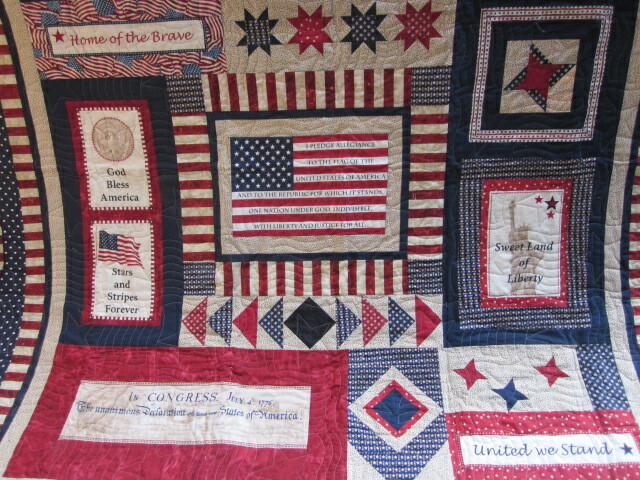 This is truly a labor of love for all who volunteer their skills to make these quilts. We have given over 100 quilts in the last three years to worthy, elderly vets in our area. They are hugely appreciated. You are welcome…I am always so impressed with the quality of quilts I am working on and do stop often to look at the fine workmanship. You must be very proud of all of your efforts on behalf of the veterans in our area. Thank YOU for all of your dedication.